Work on the bathroom remodel has been moving along nicely as of late. Finally with the milestone of a functional toilet and sink I can turn some of my attention back to the layout for a bit. After spending a while gathering my thoughts about where on the layout to start, I decided to just start cleaning. As many of you know layouts are horizontal surfaces which when under construction do a great job of gathering anything in sight. Eventually I thought of a good project to dig into. A curved section of track between Dillonvale/Pine Valley Yard and Adena had proved to be a bit sharper than I had planned. Coming out of the east end of Adena Yard the mainline standard 30" radius curve had tightened to 24" to accommodate an old route change around the water heater. In testing it wasn't causing any major issues other than just bothering me. To broaden the curve I found I would have to add a 3-4 inch bump out accommodate the new route. Prepping for new foam side extension, pre-track and roadbed removal. A small section of foam was cut out to ease the addition of a new wider section of foam. The green line represents the new right of way. To help hold the new foam section in place I inserted a few tooth picks in the foam. As seen above the new foam section was glued in with Foamboard adhesive. A couple of clamps helped hold things in place as the glue set up. Foam extension, roadbed and track in place. A section of roadbed from an abandoned idea for a continuous run connection was torn out to make way for the new right of way and a new spur for a small coal truck dump operation that existed just east of Adena Yard. The new mainline roadbed was then glued down following the new 30" radius curve. I used Cascade Rail Supply's homasote roadbed and Micro Engineering code 70 flex track, both glued down with DAP clear adhesive caulk. This revamped section will still have the west Long Run Tunnel entrance but instead of the portal being near the duct work it will be pushed back toward the furnace to make room for the truck dump spur. Unfortunately the duct work will over hang the scene but no basement is perfect and certainly not this one. After so many months it's nice to make a little progress. Especially on a section of track that had been a visual thorn in my side. To read about the NKPHTS 2018 Indianapolis Convention activities click on the below link. The best part about the modeling displays at NKPHTS conventions is that contests are a thing of the past. So there's no pressure, rivet counting or perfection needed, just a show and tell event. I've tried to display all the info I could about each model including the modelers name, and any details known about the model. Unless noted all models are HO scale. The next three N scale models are by a David B, I couldn't make out the last name sorry. A unique N scale NKP Gas Turbine by David B.
N scale NKP Snow Plow by David B.
N scale NKP MoW Crane by David B. To read about the NKPHTS Indianapolis Convention activities click on the below link. 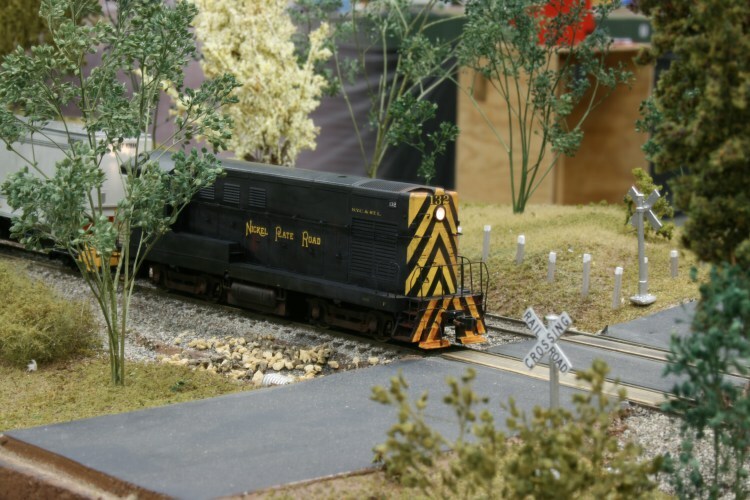 This Saturday September 22, 2018 come see a HO scale modular layout presented by the Western Reserve Free-Mo in downtown Akron, OH. My son and I will be there helping to expose the hobby of Model Railroading to a new audience. Come see us by the Children's Room on the 2nd floor! As a bonus the Nickel Plate Road #765 will be running on the CVSR a short drive away in the Cuyahoga Valley National Park. No, twenty five years later is not how long it's been since my last post but it has been almost a year since I posted anything of substance. Hang on for an explanation of the blog post title later. I do apologize for the lack of layout postings and I appreciate the concern that some of my regular readers had for my blog disappearance. A lot has happened since last my last non-Wordless Wednesday post both good and sad. Last year in the fall I took a new position at an organization I had previously interned with while finishing up my degree. I could easily say it's my dream job and feel very fortunate to return to the public sector and where I first started the path to my new career. After a few months of settling in at my new job, I had hoped to turn my attention back to the layout but a complete bathroom gut and remodel took priority. Even as I write the bathroom still commands my attention but I can finally see light at the end of that tunnel. As for the sad, after a long illness we made the hard decision to let our cat WahWah find peace in late November. He was a very vocal companion that thankfully never showed interest in the layout as a playground and will be sorely missed after 17 years in our lives. WahWah seen napping with a Fast Tracks template as a blanket. Earlier this year my wife and I also faced the first loss of a parent together when her Father lost a long battle with brain cancer. When growing up at some point you realize the possibility of loosing a parent but it always seem like something so very far away. It definitely puts a certain perception on life and where you are at in life it when it finally happens, whether it's you or to someone very close to you. After this personal update now lets get back to trains. I found once you get removed from your hobby for a while it can be difficult to find where to dip your toe back in, especially if you're in the midst of building a layout. The best place I thought to start was to clean my workbench up. This in turn spurred me to complete a few projects that had been lingering for a long time, such as the PRR hoppers I picked up for cheap on eBay awhile back. I also put together a large number of Accurail W&LE hoppers that had been piling up. The "25 Years Later" name of this blog post comes from not my absence but the time it took me to complete an old Walther's kit. While organizing my pile of "to build" kits when cleaning, I dug out a modern day Walthers tank car I bought as a teenage N&W/Norfolk Southern modeler. On inspection it looked like I had started construction but probably gave up frustrated with either the handrails or ladder based on the glue marks. Back then with a limited budget I didn't quite have the tools I do now, so with the right size drills to ream out better holes and some CA kicker I finished the build only 25 years later! While it has no place in my NKP steam era collection, it will fit in nicely with Brendan's modern day equipment. It's crazy to think of my teenage self unknowing beginning to build the car not for myself but for my future son! I hope to share some of the other little things I've accomplished model railroading-wise over the past year. Thanks for hanging in there.